I promise, your backstory is probably fascinating! 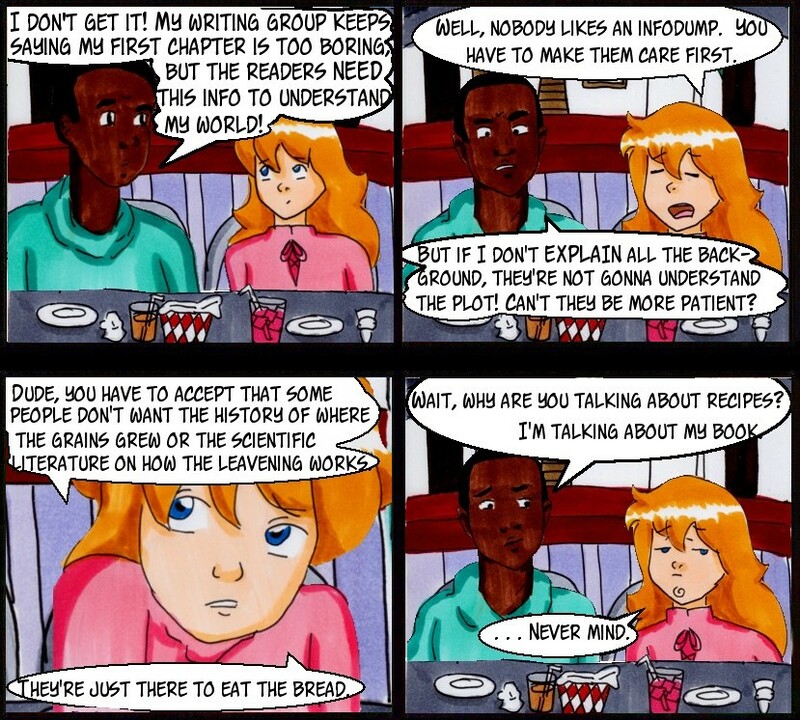 But it is not reasonable to ask your reader to sit there and let you explain it to them before it’s relevant to any characters or plot elements that they care about. 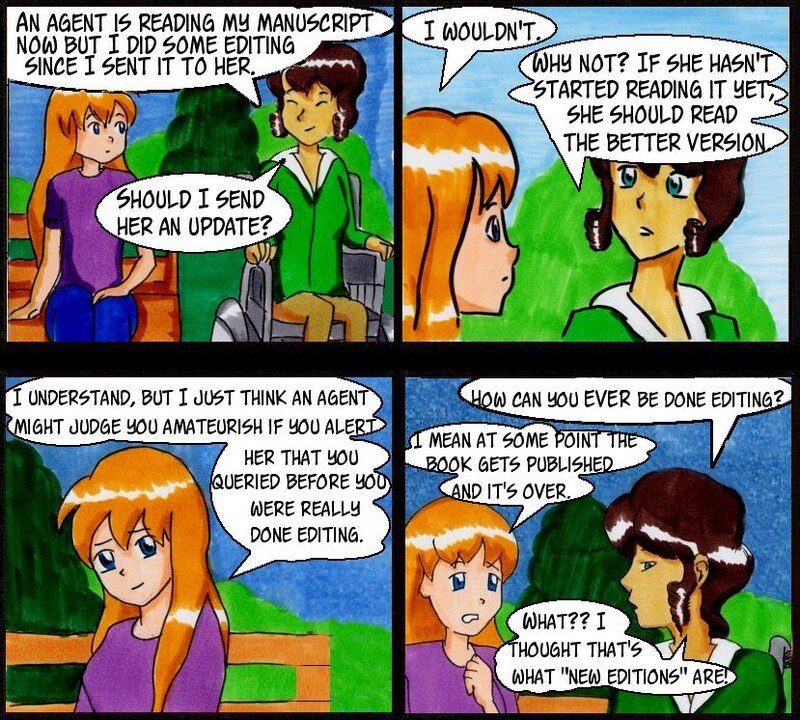 Blaming the reader for impatience isn’t practical. It’s not their job to humor you, and you shouldn’t want to be humored. You’re writing this story for them, to bring them into a world you made and to make them care about the people in your world. Don’t reject feedback like “You infodumped and I zoned out.” It’s not that your information isn’t important. It’s that the way you’re giving it to us is inaccessible. I’m not saying you can’t. 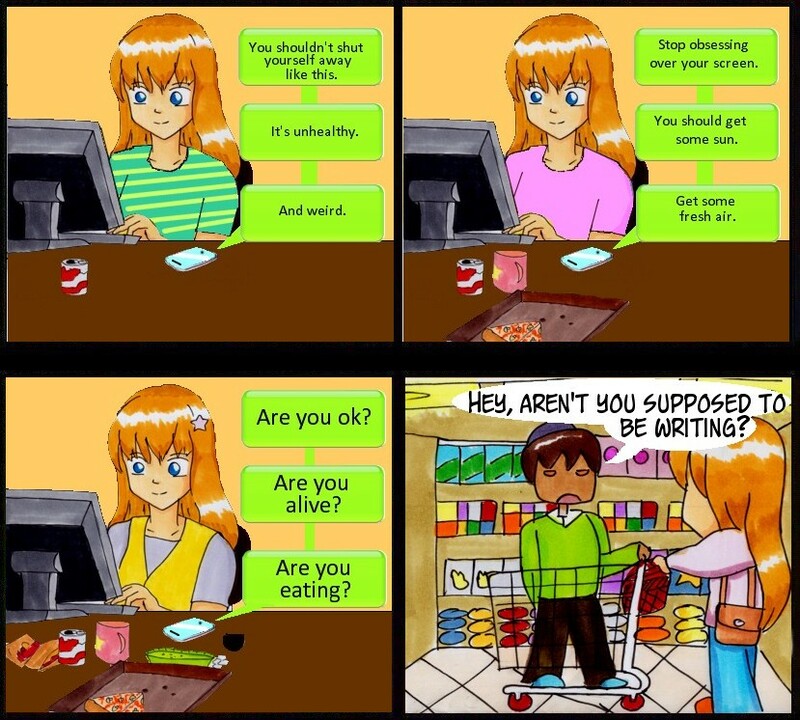 What I AM saying is that the labels for who’s talking are not the part of the writing that’s supposed to be colorful. When you write, the job of the words is to get out of the way of the story. Be as invisible as possible. Tell the reader what they need to know without individually trying to get attention. If you need a special speech tag to identify, specifically, how something is being said, then you should use it. But most of the time, you should be able to write well enough that we know HOW the character spoke based on WHAT they spoke. No need to say “‘But I don’t want to go,’ they protested.” The words themselves are a protest. No need to say “‘Sorry,’ he apologized.” The word is an apology by itself. 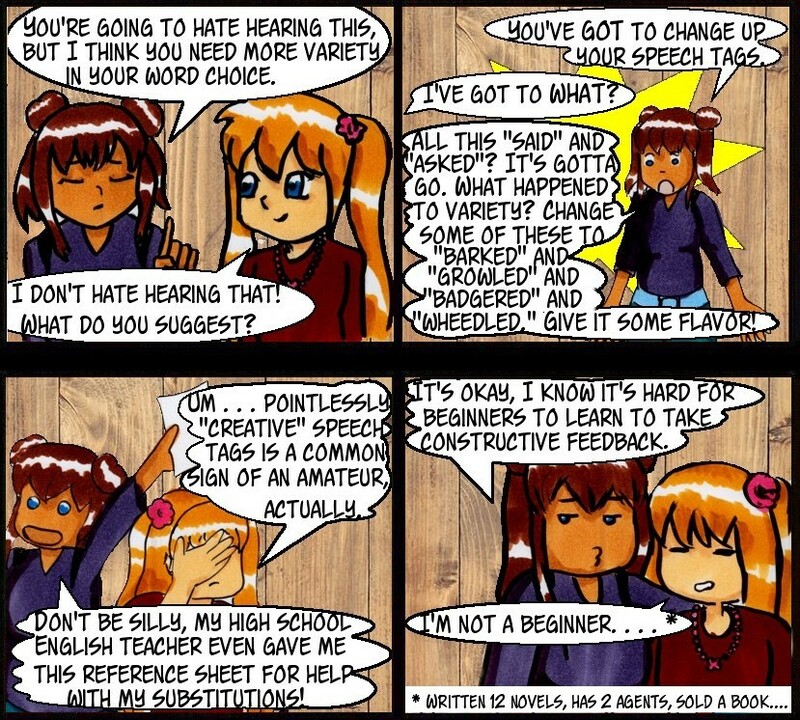 In rare cases, dialogue will be enhanced by dressing up a speech tag or adding an adverb. But in nearly all cases? It’s a distraction. Enhance the dialogue, not the words that come after the dialogue to tell us how we should have read it. Let us hear it by braiding the intent into the context of the lines, into the lines themselves. Write them so there’s no other way we can interpret them. “I know you can do it,” she assured you confidently. Just to clarify, y’all, being afraid of doing it wrong and being a marginalized person afraid mainstream authors will do it wrong/take your spot is pretty legit. In the broadening awareness that diversity is important and representation helps people, some people whose hearts are in the right place are still going about it wrong, and it’s common to worry you’ll mess it up. And for those of us from a marginalized population, you know that twinge you get when you hear someone’s writing a book about your group but the author’s not in it? Yeah. The best you’re hoping for is for them to not put a terrible stereotype or misleading narrative in the story. Fortunately, properly representing people from different populations from you isn’t as hard as you might think. It’s like any other aspect of a story that isn’t taken entirely from your own life: you have to think it through, research it sometimes, and when you’ve written it, ask others what they think. 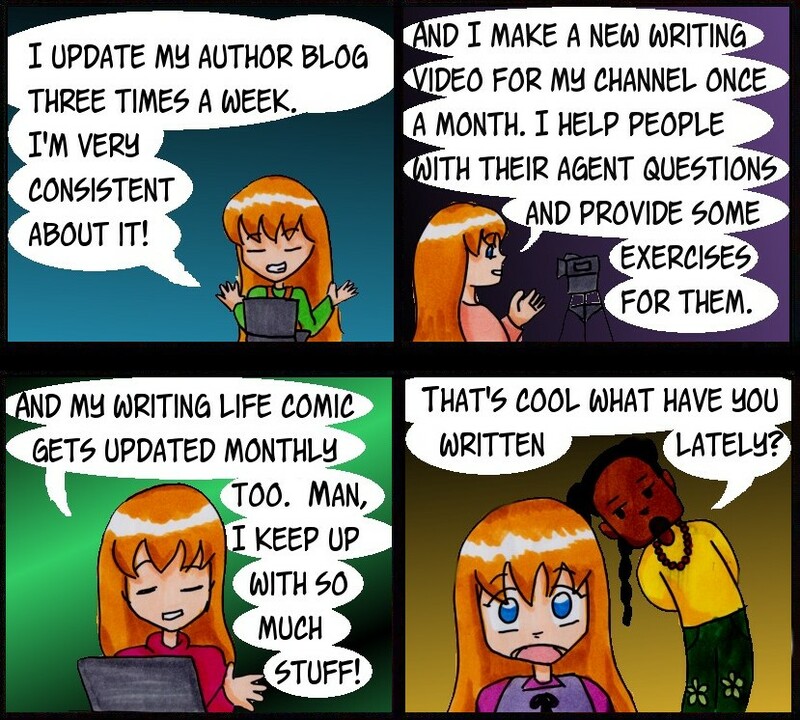 DiversifYA is a site that can help; people from various backgrounds volunteer certain aspects of their experience as resources for writers, and when you gather a critique circle, actively look for people who can make your work more authentic. It is sometimes tough to get the balance right between “writing a marginalized person as if they’re someone from your background with one small change” and “writing a marginalized person as if their marginalized identity is their entire being.” Their identities should be incorporated into who they are to the extent that that makes sense, but no one is asking you to start spitting out books that have a Diversity Message. We just want authors and readers to stop thinking of certain traits as the standard, with other traits as deviations from that standard, and we want populations in books to reflect the reality of living in a diverse world. It’s true that not every book will have certain kinds of diversity, and no one is asking you to cram it in there no matter what. But think about why your characters are the sexes, genders, races, religions, etc. that they are. After all, if “white straight able-bodied man” is code for “everyman,” couldn’t they be anyone? We get a little sucked in sometimes when we’re absorbed into a project. Try not to nag us to get back to it if we’re coming up for air, ‘kay? Like, ask how it’s going if you want! 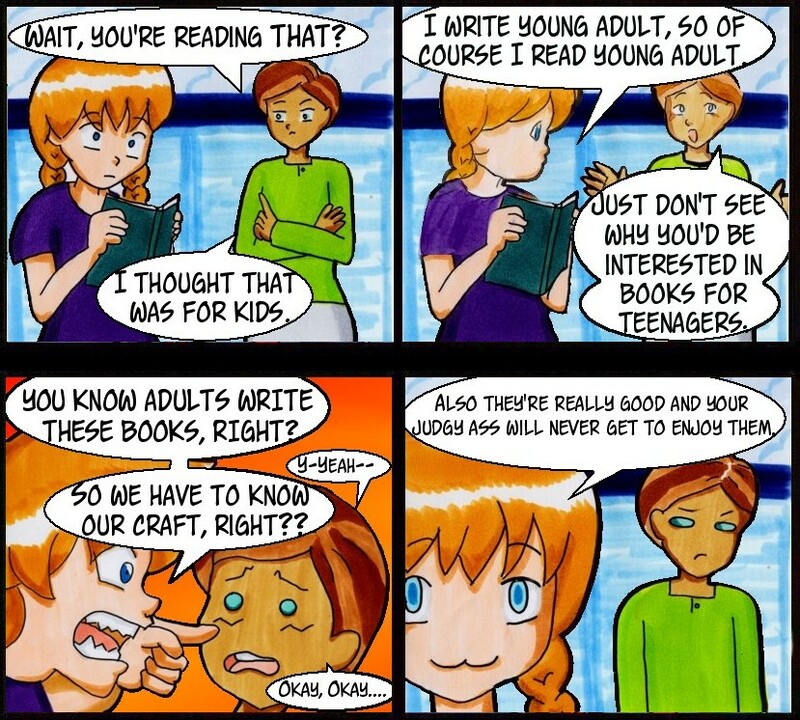 But we could do without the judgy faces and the opinions on how we should balance our writing time. It’s probably not all that balanced and may even be unhealthy sometimes, but I think everyone does temporarily unhealthy things when they’re focused on something important to them. It’s okay guys. We’ll be fine. b) You automatically own the copyright to your work as soon as you put it in a fixed form. You do not have to announce that it is yours for it to really be yours. c) Also? Nobody wants to steal your ideas. It is very hard to execute an idea, and a lazy person would not be up for the task of making a good book out of your idea and trying to sell it. If you’re really worried that literary agents are out to reject your book but secretly sell it for themselves, you are a conspiracy theorist. d) Yes, theft occasionally happens. Generally not at that level and not by agents, though. But if it is going to happen, slapping “copyright” on your work is not going to stop it. e) Registered copyrights exist so you can pay money to prove via an outside source that the copyright belongs to you. 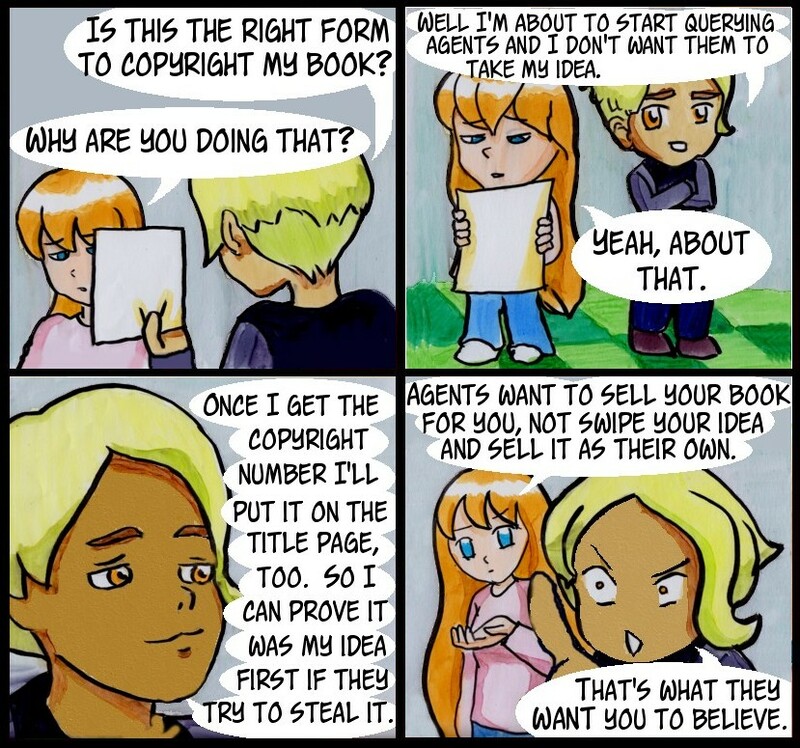 You have a copyright even if you don’t register it, but you should not register a copyright for a book in your name if you are trying to sell it to a publisher. They will copyright the book. f) If you really are truly unable to stop worrying that someone is going to swipe your idea because it’s just that good (even though an agent is hoping to collect part of your paycheck for selling it for you), buy some peace of mind by sending the manuscript to yourself through the mail in a sealed envelope so you can prove, due to the postage stamp date, that it has been yours since at least that date. (The process is affectionately called “the poor man’s copyright.”) This doesn’t necessarily hold up in court, but at least it’s evidence of some sort that you wrote this thing and put it in a package that’s been sealed at least X long. g) I don’t mean to shame anyone for worrying that your precious hard work might be taken from you, but ideas are cheap and selling them/fleshing them out is hard. 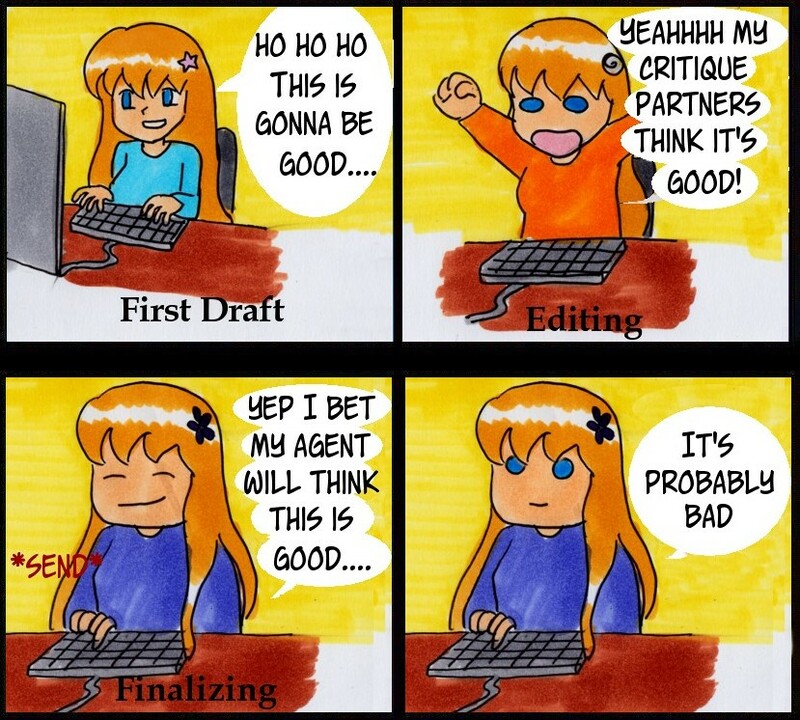 Agents, especially, are in a business that helps connect writers to publishing opportunities. 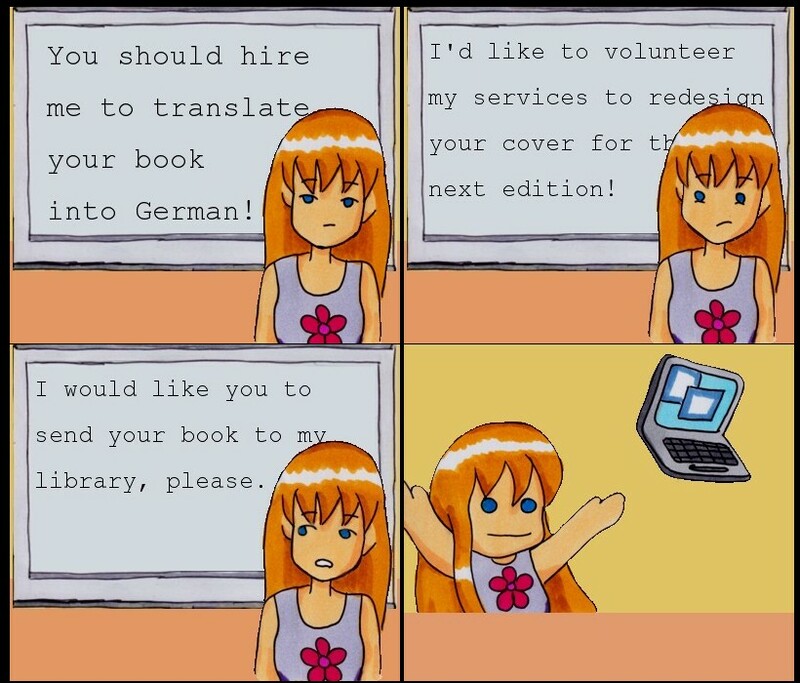 They want you to write the book and succeed. They have nothing to gain as an agent by sneaking off with your work, and if you’ve done your research on agents, you should know which ones are reputable. Don’t submit to anyone disreputable and you’ll be fine.